UFC president Dana White believes former bantamweight champion Ronda Rousey will return to action in November. During an appearance on "The Neighborhood" radio show, White said Rousey will face the winner of a March 5 championship bout between defending titleholder Holly Holm and Miesha Tate. Rousey (12-1) hasn't fought since she suffered a second-round knockout loss to Holm (10-0) at UFC 193 in November. She has not provided a hard time frame for a return, but has stated she intends to fight sometime in 2016. "Holly Holm will fight Miesha Tate on March 5," White said. "The winner of that will fight Ronda, probably in November." Originally, there was speculation the UFC would book an immediate rematch between Rousey and Holm, who is also a former world champion boxer, at UFC 200 on July 9 in Las Vegas. Rousey, however, needed more time before a potential second fight against Holm. She is scheduled to film a remake of the film "Road House" in April. When asked about Rousey's mental state, more than two months since the loss, White said the former champion is doing well. "She's very intense," White said. "She's a badass. She'll be back." In a recent interview with ESPN, Rousey's head trainer, Edmond Tarverdyan, also said Rousey would come back stronger than ever. "Ronda is a born fighter," Tarverdyan said. 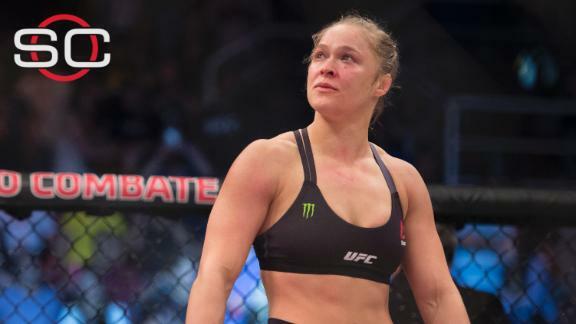 "Ronda is going to stand up and get in there, ready, with the same nasty attitude. She's going to go for it. She's going to be ready to fight." Will Rousey's November return come to fruition? ESPN MMA Writer Brett Okamoto breaks down the probability of Ronda Rousey returning to fight in November and who she might see across from her in the Octagon in that match.